Pouring rain coupled with animal sacrifices all over the city have created a strange and disturbing scene. As forecast by the meteorological office, Eid morning on Tuesday began with shower that continued intermittently into the evening. 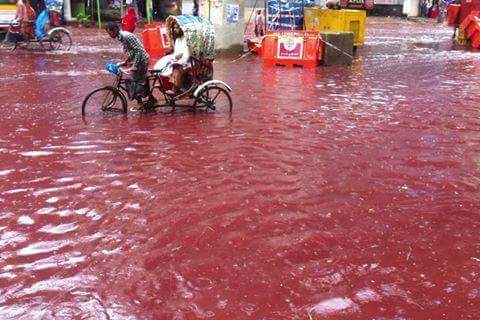 Despite the pouring, Dhaka’s citizens went to say their Eid prayers in the morning and sacrificed their animals. 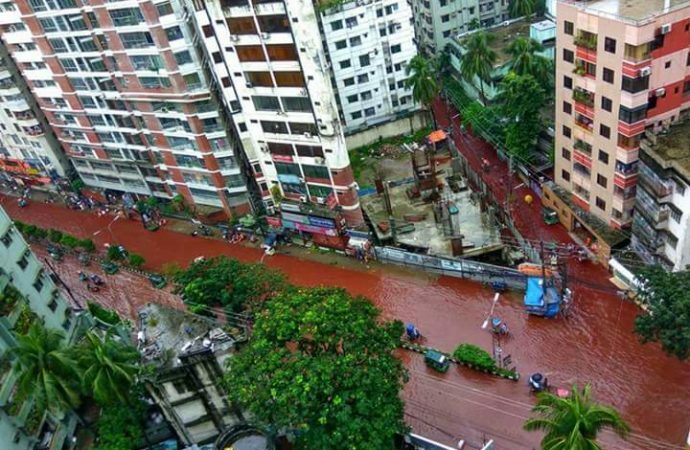 As rainwater built up on the roads of Dhaka and flooded many areas of the capital it got mixed with the blood to create an unusual and gory scene; it appeared as though there were red rivers running across the city. Citizens have strongly criticised the two city corporations in charge of cleaning the sacrificial waste for this situation. This entry was posted on September 14, 2016 at 5:37 pm and is filed under Behaviour, Religion. You can follow any responses to this entry through the RSS 2.0 feed. Both comments and pings are currently closed.